Content by Kathleen Noone. 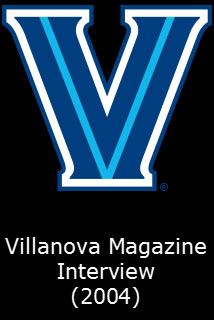 Originally published on October 1, 2004 @ Villanova Magazine. Frank Capra [ed. note: corrected from John Wayne in original] called him a genius. Shirley MacLaine spilt coffee on him. He studied his subjects, understanding why Alfred Hitchcock varied his pose in several scenes and noticing when Wayne changed his accent. He discovered that Stockard Channing's favorite author was Nabokov and questioned Charlton Heston about why Jane Fonda was unemployable at the box office. Dialing the phone of F. Anthony "Tony" Macklin '60 A&S, '63 .MA., who lives in Las Vegas, I experienced a mixture of intrigue and intimidation at the thought of interviewing one of the master interviewers of the 20th century. I needn't have worried. Macklin was as direct and upfront on the phone as he was when conducting his own interviews of Hollywood's greats. "I want you to capture my winsome personality," he laughingly told me. Macklin reviews movies for a national sportscaster's Las Vegas radio show, "The Al Bernstein Sports Party" (ESPN Radio 920). For 37 years, until his retirement, Macklin taught English and film at the University of Dayton. In 1965 he founded his own film magazine, Film Heritage. He served as its editor until the magazine ceased publication in 1978. Macklin's criticism also has been published in Film Comment and Film Quarterly, and his fiction has been published in the North American Review. He is the editor (with Nick Pici) of Voices from the Set: The Film Heritage Interviews (2000, Scarecrow Press), a compilation of Macklin's 1970s talks with film's most intriguing stars, directors, writers and other professionals behind the scenes. It was an era when the "old Hollywood" was giving way to the new cinema. The great names of the silver screen roll off his tongue with ease and intimacy, as Macklin chats about Ava Gardner's "animal magnetism" and the way in which Ingrid Bergman triumphed over personal troubles. "She was vilified politically, and she prevailed," he said. His dinner companions over the years would impress even the most elite diners. "I ate with John Wayne, Jimmy Stewart, Chuck Jones, Basil Rathbone, Ray Bradbury, Cybill Shepherd (who told somebody 'I like that guy with the beard. He's my kind of man'), Bob Altman, Dennis Hopper, et al.... Designer Edith Head said I looked like 'layer cake.' I guess the divine Cybill likes layer cakes," Macklin told me. Discussing the way in which he conducts his interviews, Macklin says he emphasizes focusing on the essential qualities of the interviewee. "Everybody was looking for the grabber. I was looking for knowledge," he said. "I'm not like Charlie Rose or Chris Matthews, where I'm not interested in my question. I was more interested in getting the truth and humanity behind the person. "If I'm going to interview somebody, I want to know everything he or she has done, and I want to see them in a personal way, so I'm not just some other interviewer," Macklin said. "I was very fortunate in that the people I interviewed had special qualities. John Wayne, Charlton Heston, Hitchcock -- those people are just different. There's something about them that makes you realize all people aren't the same. " According to Bernstein, Macklin's talent as a film critic derives not only from what knows but from his ability to communicate his viewpoints. "The thing I really enjoy about Tony's film reviews is that he is so knowledgeable about film history and the art of making movies, yet he is not a snobby critic who believes he is supposed to endorse a movie because other critics have done so," says Bernstein. "He tells you what he likes and why he likes it -- and goes a step further, by suggesting certain kind of audiences that may or may not appreciate the film." Bernstein adds, "Tony has few boundaries as a reviewer. He can see excellence in any genre and in any kind of movie." Macklin's contributions to the world of film criticism have not gone unnoticed. Since 1952, every l0 years Sight & Sound magazine, published by the British Film Institute, takes a poll of about 250 major filmmakers and figures in film. Since 1971 Macklin has been one of the few academics regularly asked by Sight & Sound to contribute his list of "the 10 greatest films of all time." Despite his extensive experience as an interviewer, however, Macklin hesitates when asked to describe what he feels are the most important qualities of a good movie critic. "I can tell you what I like and what works -- the truth, validity. It's someone else having an opinion that's different from yours, but you see it make sense." Macklin has followed film criticism for the majority of his life. While at Villanova University, after earning his undergraduate degree, he wrote his master's thesis on James Agee, the writer and film critic. After receiving his master's degree, Macklin, a Philadelphia native, accepted a one-year position teaching at Dayton, which resulted in a 37-year academic career there. He incorporated film criticism into his syllabi during a time when schools were first beginning to consider movies worthy of study. Not surprisingly, Macklin taught the first film course at Dayton. "I came along at a perfect time because film had not yet been recognized as an art form. Most schools didn't recognize film. I was able to be an explorer for film," Macklin said, recalling his years at Dayton. "I love gambling, but I could never be a gambler as a professional because it stops being fun. Teaching is probably the only profession that never stops being fun." Focusing on the changes between film criticism in the 1960s-70s and that of today, Macklin implies that contemporary criticism often lacks sources for expansive discussion. As he reflects upon a career that spans almost four decades, the only tinge of regret Macklin's voice evinces when he talks about the ocean. "For 50 years, I went to the [Jersey] Shore, and in Vegas, there's no ocean. I miss Ocean City," Macklin said, immediately breaking off from supplying me with a brief description of his career path. But he does say that in 2000, "I came out here for a three day vacation and never went back again...I was going to live half in Ocean City and half in Vegas, but never left Vegas. If I have to have an ocean, and I do, I have the Pacific. But when you live in Vegas, it's hard to go on vacation." Despite his distance from the ocean, life holds few regrets for Tony Macklin, whose passion for sports almost rivals his passion for cinema. "Philadelphians love games, and I'm in the city of games," he told me. "I'm going on the air today to talk about movies and sports...what could be better?" For one of the greatest contributors to 20th-century movie criticism, not much at all.